Year by year Kiev becomes more and more beautiful. Dozens of old historical buildings have been renovated; hundreds of new hotels and restaurants have been opened for the last years. New parks, indoor and open-air swimming-pools, casinos and bars give tourists everything they need to have fun day & night. Prices are rising every year, as Ukrainian economy is getting stronger and stronger, but anyway Kiev offers something special for tourists with any budget. You can choose accommodation at a private apartment in Kiev downtown and not expensive meals at the nearest cafe or you can stay at the one of the best Kiev hotels listed below. We'll be happy to help you with choosing the right Kiev hotel or apartment for your needs and budget. Please, review our propositions and make your Kiev hotel reservation today! Only a couple minutes walk from Khreschatyk Street. Very close to the Golden Gate, Kiev's "Central Park" and the National Opera House. The hotel invites you to dine at its two restaurants, take a snack at the two snack bars, or enjoy a special event in the banquet hall. The hotel has a one-of-a-kind vitamin bar and beauty care facilities, a Fitness Center and a swimming-pool. Other amenities include: Parking; Smorgasbord; Cloakroom; Internet; Shopping; Hairdresser; Satellite TV and ATM. Right in the city center, very close to the Mariyinsky palace, Dnipro river, and just 2 min walk to the the Independence Sqr. Hotel Dnipro offers single, double, Junior Suites, Semi-Suites and Superior Suites of Standard and Renovated types. All rooms are equipped with direct telephone line, Internet, Sat TV. Restaurant & 3 bars of Dnipro hotel propose you legendary dishes of Ukrainian and European cuisine. 15-min walk to the city center, Khreschatyk Str and 5 min to Olimpiysky Stadium, the Sports Palace, and the Central Synagogue. 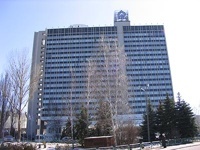 President-Hotel "Kyivsky" offers 340 guest rooms; 2 halls of restaurant "Kyivsky" in the hotel; restaurant "Old Fortress" near the hotel; 4 banquet halls, congress-hall; conference-hall; Business Center; Separate meeting rooms; Secure, heated underground parking; Swimming Pool; Sauna; Hairdresser; Satellite TV; Car Rental; Internet; Casino. Located in the heart of old Kyiv district Podil few steps from several museums, Orthodox cathedrals, theatres and business office buildings as well. Hotel Podol Plaza has all the advantages of a large establishment, yet exudes the warmth, intimacy and attention to detail, which only a privately owned hotel can afford. Hotel offers 57 cozy rooms for 124 guests. Combination of the picturesque view and warm color decoration makes each room unique and unforgettable. 16-storeyed Hotel "Ukraina" is perfectly located in the cultural & business center of Kiev right on the Independence Square. All rooms are equipped with phones with international direct dial, showers, toilets and television with cable TV. Hairdresser's, Gift Shop, Ice Machine, Laundry Service, Parking, Sauna, Massage, Secretarial Service, 24 Hour Security. Hotel's restaurant serves European and traditional Ukrainian cuisine. 27-storeyed Kiev Hotel "Adria" is one of the best hotels in Kiev on the left bank. Located at old hotel Turist (meters away from metro station Levoberezhna) it offers fully renovated rooms for clients with any budget. 46 charming rooms, refined with a family touch and equipped with all modern amenities. In each room you will find air conditioner, a shower, a mini-bar, telephone, SatelliteTV, hair dryer. Guarded parking available for cars & buses. Built in 1988 on the main street of Kiev, Hotel Khreshchatyk offers comfortable rooms for those who travel on Economy budget, but prefer to stay in downtown. Hotel has 104 rooms: 48 single, 46 double and 10 de luxe rooms. Bar, two restaurants and sauna. Completely renovated in 2002 hotel Lybid is located in the center of Kiev on the Peremohy Sqr, near the circus and the biggest supermarket of Kyiv-Ukraina, only minutes walk from Kiev railway station. Electronic system of door locks, individually controlled system of heating and air-condition, Sat TV in each room. Currency exchange, hairdressing saloon, dry cleaning, laundry and various shops & bars including one casino. Hotel "Andriyivsky" (Andrew) is situated in one of the oldest, most original and picturesque streets, Andriyivsky Uzviz. Hotel offers the domestic coziness and unique atmosphere of the Podil district and Andriyivskiy Spusk. Hotel amenities: Restaurant, serving dishes of Ukrainian and European cuisine; bar; banquet hall; Sauna; Laundry. All rooms with Satellite TV; Direct dial telephone; Shower. Room Service. 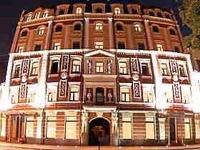 Hotel Kozatsky" is situated right in the centre of Kiev Ukraine - on the Independence Square. Due to its location Kozatsky Hotel is considered as one of the most popular Economy hotels in Kyiv. There are 152 rooms totally: 25 Suites, 56 Junior Suites, 43 Double rooms and 20 Single rooms. Restaurant, Cocktail-bar, Internet café, Bookshop and Souvenirs shop.